In case you haven't figured it out yet, this week I've been on a serious tobacco fragrance kick. So no, I'm not imagining that every fragrance I own has tobacco in it. It's just that I've been craving the smell of tobacco, in all its forms, and I've been pulling all of my bottles out of storage. This brings me to Casaque Homme, a fragrance I reviewed almost a year ago and trashed. Since that time, I've had a chance to wear it a few more times, and my opinion of it now is much higher than it was back then. I feel like I completely misread this fragrance when I reviewed it, because what I smell now is far different from what I described in my prior review. This is not the prissy, orange blossom-based wuss-fest I described before. 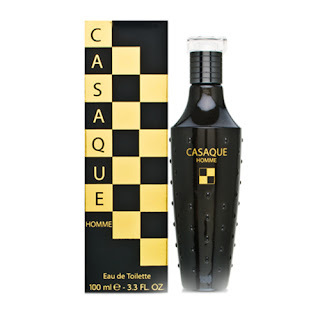 Instead, Casaque Homme is a quiet, discreet and refined tobacco fougere. It's still a sweet fragrance, but that sweetness is bone dry, and it gets its sweetness from tonka bean, not vanilla or amber. The lavender and tonka bean are what make this a fougere, but the most prominent feature of Casaque Homme is the tobacco. This is not the balls-out macho treatment of tobacco you get in Quorum, Cuba Red or Cigar Commander. This is a soft, light, sweet and almost floral grade of tobacco smell, like the tobacco note you get in Dolce & Gabbana Pour Homme or Versace's The Dreamer. I think of it as the smell of tobacco in a cigarette, before it's been smoked. It's handled delicately, not in your face. Because it's well blended with the lavender and tonka bean, you may not immediately recognize it as a tobacco note. Wearing Casaque Homme won't make you smell like a tobacconist. This may not be the most exciting fragrance in the world, but it's tasteful and exudes a lot of class. As I wrote in my prior review, its strength is moderated perfectly, which mean it doesn't have mind blowing sillage. Casaque Homme stays tastefully close to the skin. I don't know what happened when I wore this before my prior review, but something was off. Maybe I was in a bad mood, and may not have been in the mood to wear it. I don't remember. What I do know now is that I really like Casaque Homme, and that it's going to be seeing a lot more playing time than I'd previously thought. Thumbs up now. I own Casaque and I like it. It's pretty unique in my arsenal. Like you I often don't like sweet fragrances, especially bakery vanilla oriented ones, but here the sweetness is attenuated. It seems almost boozy. I find it closer to Richard James or Lagerfeld than to Pour un Homme for example (not in smell but in style). I read your earlier review and was a bit surprised that you hated it so much, but it's nice to reassess, especially when it's for the better. Yeah I did a total 180 on this frag. I wish I could find a note pyramid on this one, because I could swear there's both lavender and tobacco in it. The tobacco note is especially noticeable in the drydown, which smells a lot like SMN's Tabacco Toscano. I didn't even recognize it as a tobacco note until I tried The Dreamer by Versace.